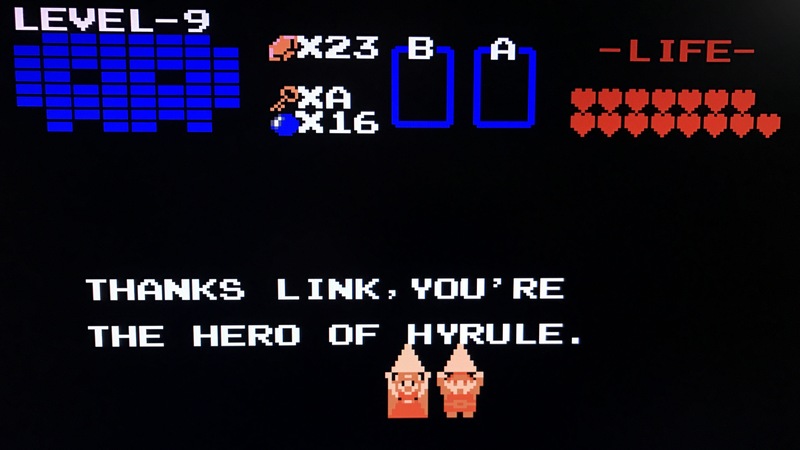 Finished The Legend of Zelda this afternoon. I explored the world and played quite a bit on my own before following an official walkthrough. I must have selected a potion instead of a heart in one of the caves since I didn’t end up with the full 16 hearts of life. It was fun to play through. Crazy to realize the copyright year listed in the credits is 1986! I could play through the second quest. I like the entire Zelda series. We haven’t played them all – we missed some of the earlier ones – but they are generally really high quality and fun all the way up.